Did Gear4 shoot themselves in the foot when they named their latest iPod speaker system HouseParty 4? With two 3-inch tweeters throwing out 30 watts of music, it falls short of the power needed to rock the house but perhaps Gear4 had a different kind of house party in mind. 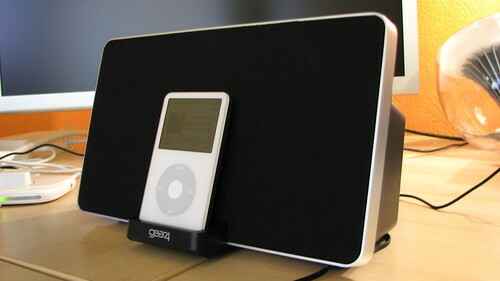 The HouseParty 4 is a stylish iPod speaker system, finished with a soft black speaker grille that spans across the entire front of the unit, you would be forgiven for mistakenly thinking that this was a slim-line speaker. 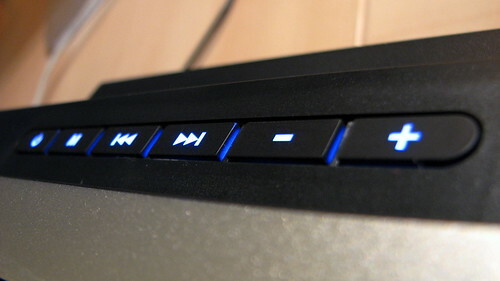 Step around to the side and you can see the rear of the system that contains the two speakers and a set of blue backlit keys. Whilst I understand that the designer wanted to keep the front fascia clean and uncluttered, there’s a slight injustice to hiding the backlit keys with the raised front edge. The keys aren’t visible unless you really look behind the unit, rendering them useless. A big issue? Probably not, since most of us are too lazy to get up and push the buttons anyway. Behind the speaker grille is a hidden LED display that lights up in bright red whenever you change the volume or source of audio. It’s an unexpected nicety that Gear4 have included to provide visual feedback to some of the functionality and complements the clean speaker grille design. 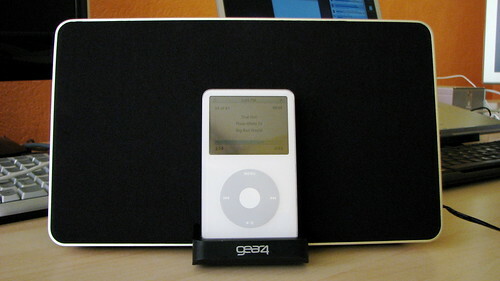 Like many iPod speaker docks before it, the remote is palm sized and uses soft touch keys. 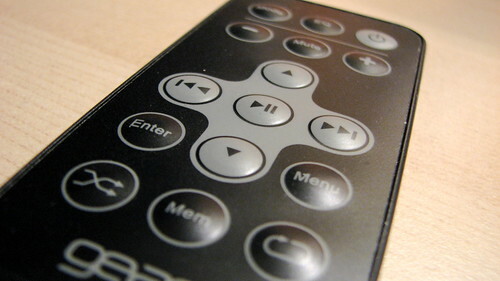 The remote itself looks simple, but in reality, it’s actually quite practical. Usual playback and volume controls are available, but you’ve also got the shuffle and repeat as well as an equaliser and menu control buttons. 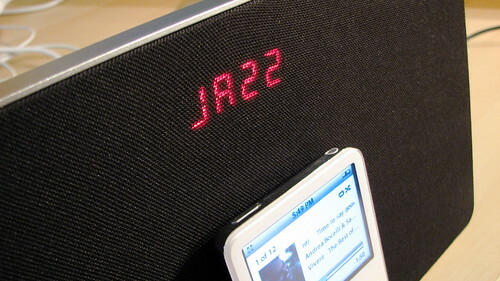 The menu buttons give you control over the iPod menus, so you can navigate through your menu system. For small speaker systems like this, I tend to have them sat quite close to me on the desk whilst I’m working. Rather than having to reach for the iPod at an awkward angle to change playlists, I can use the remote instead. To test the audio quality of the speaker system, I listened to a whole range of music genres. This included hip-hop and dance tracks from Ne-Yo and Nadia Alia to test out the bass levels, to classical tunes from Andrea Bocelli and Sarah Brightman. And of course, I couldn’t not mention the likes of John Mayer, Jack Johnson and Kings of Leon. The low frequency bass response won’t blow you away. You can give the low levels a boost by choosing from one of the seven preset equaliser settings, however you may get mixed results. For the majority of the time, I set the equaliser setting to off, which leaves you with an authentic listening experience. I’ve listened to my music collection on a wide range of speaker systems ranging from ultra mega-expensive models to my laptop speakers and the HouseParty 4 ranks in the middle, with a quality sound that will do itself justice for the market it’s aimed at. I can’t honestly say there’s anything exceptional about the sound from the HouseParty 4, which is why you might want to reconsider if you’re thinking of buying this to really rock the house. On other hand, if you’re looking to have a private party of your own with your favourite playlist, then the HousePart 4 will definitely tick the right boxes. At under £80, HouseParty 4 is a well balanced combination of a contemporary speaker system that will fit well in any room in the house. With just two tweeters packed in to a small system, bass lovers were always going to be disappointed, making the HouseParty 4 ideal for casual home listening.